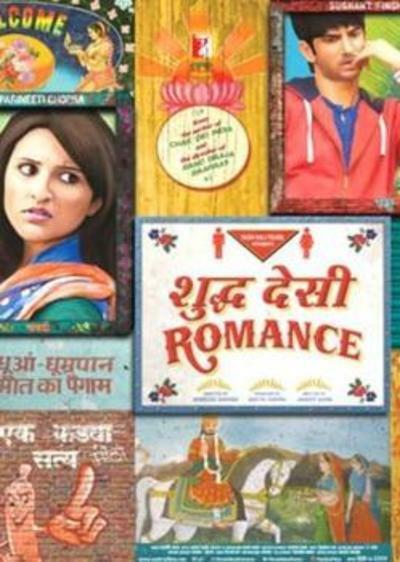 Unless something very good comes out between now and December, "Shuddh Desi Romance" will be the best romantic comedy made anywhere in the world for 2013. It's another fine entry in director Maneesh Sharma's resume, following the splendid "Band Baaja Baraat" and "Ladies vs. Ricky Bahl." Jaideep Sahni's script is sharp and the whole cast is splendid. The film plays with romantic comedy genre elements in an interesting way, but first and foremost is concerned with being romantic and being funny, and succeeds nearly perfectly on both counts. Protagonist Raghu (Sushant Singh Rajput) is a young man in Jaipur who makes extra cash working for a wedding planner (Rishi Kapoor) as a hired wedding guest, so—for instance—a groom who needs a few more reasonably presentable friends and/or family members would engage his services. The story opens with Raghu himself about to get married, to a woman he barely knows (Vaani Kapoor). On the way to the wedding, he meets and falls head over heels for Gayatri (Parineeti Chopra), another hired guest. Then, right in the middle of the wedding ceremony itself, Raghu panics and runs away. From that starting point, though, the story consistently resists the predictable choice. The three leads are all superb, with Sushant Singh Rajput managing to make a potentially difficult character, with all his indecision and passivity, sympathetic: the movie hinges on the audience wanting Raghu to eventually grow up and find true love. Here, it helps that the movie doesn't ask us to sympathize too much with Raghu; it's made blatantly clear that he does indeed need to grow up. Rajput's charm as an actor—it's amazing that this is only his second film; he was equally good in "Kai Po Che!" earlier this year—keeps Raghu from ever wearing the audience's patience too thin. Rajput, barring any unforeseen obstacles, should be a major star in years to come. Even more impressive, though, are the two female leads, both of whom have more agency as characters than one usually sees in modern romantic comedy, and both terrifically played by the respective actresses. Gayatri is the more overtly "modern" of the two, at first: she's assertive and sexually independent, but still haunted by a past that's seen its share of pain. Parineeti Chopra shines in the role, playing it with an elegant ease that defies her relative youth. Even more impressively, Vaani Kapoor does the same as Tara, the jilted bride. Her reappearance in Raghu's life comes at a point whose particulars shouldn't be spoiled, as they're both inevitable and surprising somehow, much like the movie as a whole. Rather than wither away in shame after her ill-fated wedding, Tara takes control of both her life and, ultimately, the narrative of the film. The 21-year-old Kapoor, in her debut, has the poise of a veteran and the charisma and talent to become one. An elder (unrelated) Kapoor, Rishi, does his best work in years as the wedding planner, who in spite of the potentially cynical nature of the work he does, still has a rather sweetly old-fashioned romanticized belief in the power of marriage. That the movie still portrays him fondly despite being a bit more skeptical about matrimony and all its trappings is the key to its balance: there's no meanness to "Shuddh Desi Romance," though there is a sharp intelligence to it. If there's any quibble to be had with the film, it's that the pace flags slightly in places. That it does, though, is more due to Maneesh Sharma's direction trusting that the audience will find genuine moments between people compelling. There are certainly enough of those moments to make "Shuddh Desi Romance" not only engaging, but delightful. The songs are terrific, blending local folk music with modern pop, and choreographed smartly. The best part about "Shuddh Desi Romance" is that it's not reinventing the wheel. It's merely a testament to how much fun a romantic comedy can be by simply hitting all the right notes and letting the characters drive the story rather than perceived obligation to genre fidelity. "Shuddh Desi Romance" is an immensely satisfying night at the movies, and, until further notice, the year's standard bearer for romantic comedy.